Months after the death of Sen. John McCain, President Donald Trump continues to criticize him on Twitter. The president tweeted on Sunday that McCain was "last in his class," and accused the late senator of sharing the Steele dossier with the FBI and media before the 2016 election. "So it was indeed (just proven in court papers) 'last in his class' (Annapolis) John McCain that sent the Fake Dossier to the FBI and Media hoping to have it printed BEFORE the Election," the president tweeted on Sunday morning. "He & the Dems, working together, failed (as usual)." "The allegations were disturbing, but I had no idea which if any were true. I could not independently verify any of it, and so I did what any American who cares about our nation's security should have done," McCain wrote. "I did what duty demanded I do." 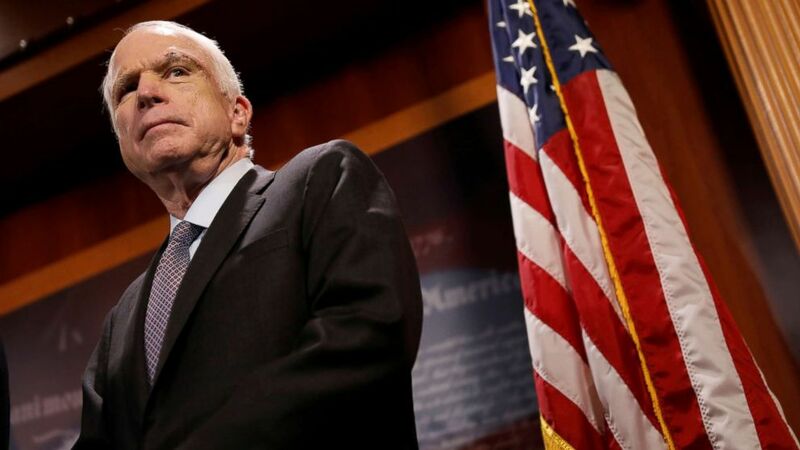 Sen. McCain was not shy about finishing towards the bottom of his class at the U.S. Naval Academy, and once said in an interview with CBS News program "60 Minutes" he was proud of what he had accomplished. "I celebrate what a guy who stood fifth from the bottom of his class at the Naval Academy has, has been able to do. I'm so grateful -- every night when I go to sleep, I am just filled with gratitude," he said. On Saturday, the president accusing McCain of spreading "a fake totally discredited Dossier," calling it a "very dark stain against John McCain." The president also criticized McCain for his "thumbs down" vote on the GOP proposal to repeal the Affordable Care Act in 2017. "He had far worse 'stains' than this, including thumbs down on repeal and replace after years of campaigning to repeal and replace," the president tweeted. President Trump has been fixated on Sen. McCain over the years with criticisms of his military service, being a prisoner of war and his policy positions. "He's not a war hero. He's a war hero because he was captured. I like people who weren't captured," Trump said in 2015. "No one will ever love you the way they loved my father.... I wish I had been given more Saturday's with him. Maybe spend yours with your family instead of on twitter obsessing over mine?," she said Saturday. She responded to the president's tweet on Sunday by tweeting: "My father lives rent free in your head." The tweet was later deleted.